Kanheri caves one of the oldest site in Mumbai which date from the 1st century BC to the 10th century BC. It demonstrate the Buddhist influence on the art and culture in India. This unique Buddhist Monastic sheds light on different phases flourised over there from 2nd century BC to 11th Century AD. It showcases the art architecture of Hinayana and Mahayana sects of Buddism and Epigraphic data of its time. The cave have 110 in total numbers, are excavated in general plan consisting of a main sanctum and outer courtyard approached through flight of steps. The courtyard has two water cisterns underneath on either side some of the courtyards are provided with sitting benches along the wallls architecturally, caves. Many sculptures of Buddha therein are displayed in different poses. Buddha is symbolized in the form of Stupa Boddhi Tree and Foot prints. This reveals Hinayana phase of Buddhism. The most elegant images of Buddha are shown in specific themes as Sthanaka Buddha, Mortal Buddha, Buddha attended by Boddhisattva and Tara other images carved in the caves ae Sarvandada Avalokiteshvara, Boddisattva Muchalinda Naga. At Kanheri the inscriptions also give the names of post Satavahana Kings Vasishtiputra Satakarni, (Cave no.5) Yajnasatakarni, (Cave no.3) Mathariputra Shakasena (Cave no.74), Chutukulananda Satakarni, (Cave no. 66). There are few paintings in cave 34 in post Ajanta style beside that miniature stupas and remains of Dam are also available over here. The site is protected by the Archaeological Survey of India as a centrally protected monument. 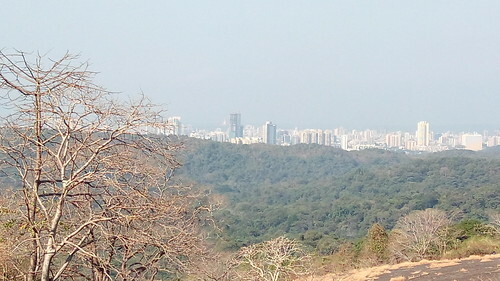 Kanheri Caves are located inside the Sanjay Gandhi National Park (SNGP) in Borivali. The entrance for Kanheri caves is same as that of SNGP. 10 minutes walk (2.5km) from Borivali station East till SNGP main gate. From Borivali railway station, Auto takes minimum fare. The entrance of SNGP is easy to find which is besides the main road at the junction of signal of Borivali station road. BEST Bus 188 from SNGP Gate to the entrance of Kanheri caves. The Bus have frequency of 15 minutes. Below 15 years FREE entry.